The document lists 3 Raleigh based officers: Dallas Woodhouse as President and Treasurer, his father-in-law Duane Ischer as Director (listed elsewhere as Secretary), and environmental engineer Todd Brozell, another Director. No salary was paid directly to Woodhouse but $72,000 was paid to his wholly owned company Solutions NC, Inc., for management services. 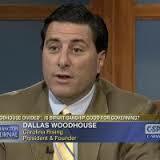 Woodhouse has consistently declined to name Carolina Rising’s donors. The existence of just two donors in the IRS filing is in contrast to statements Woodhouse made to the Center for Public Integrity in November 2014 when it profiled the group’s election year spending. If the statement is true, it suggests that funding passes through one or more other entities before arriving at Carolina Rising, on its way to Crossroads Media, LLC. Siphoning off a bit for "management services." NCGOP better get ready for that same siphon hose.